A drink for any occasion. A well-stocked bar is at the center of good entertaining. It will adapt to the tastes of your guests and offer almost limitless combinations to sip on. With 7 bottles—and a few optional add-ins—you’ll be shaking and stirring your way to better parties and get-togethers in no time. And while there is some initial investment, these ingredients will last you for some time. Spirits serve as the foundation of most cocktails and can be built upon in endless combinations. Gin derives its flavor primarily from juniper berries, which are known for their strong, distinct, and astringent flavor. Most of you are familiar with the classic Gin and Tonic, but there are a plethora of other gin cocktails to enjoy, including the Negroni, Gin Fizz, and Martini. Vodka is most commonly made by the distillation of potatoes or cereal grains. It is often drunk on its own, but is a versatile and adaptable base for many cocktails, including the Moscow Mule, the Cosmopolitan, and the Bloody Mary. When we think of tequila, we often think of shots or Margaritas—but this Mexican spirit, which is made from the blue agave plant, can be transformed into many other tasty cocktails, as well. Whiskey and bourbon are great on their own, neat or on the rocks. But they also are a key ingredient in many classic cocktails, including the Manhattan and Old Fashioned. Vermouth is a fortified wine that is flavored with various botanicals, most commonly herbs and spices. You can find both sweet and dry vermouth; both are great to have on hand. They can be drunk on their own or mixed in various cocktails. Cointreau and Triple Sec are orange-flavored liqueurs that are commonly used to infuse cocktails with citrus flavor. 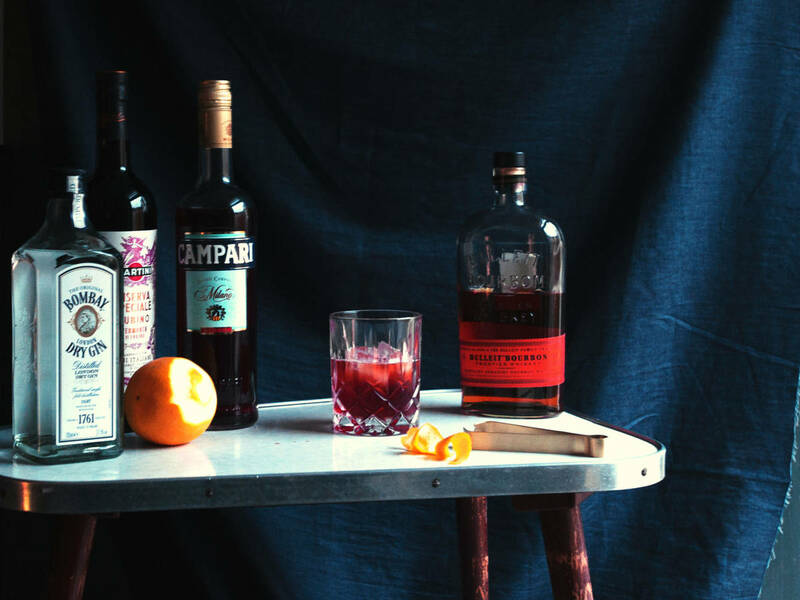 Known for its deep red color and bitter taste, Campari is an herb- and fruit-infused aperitif. It is often combined with soda water and citrus, and most famously, is a key component in the Negroni. Originally produced to combat upset stomachs, botanical bitters are now a common flavoring in cocktails. A staple at any bar to make a variety of mixed drinks. Simple syrup is made by simmering one part sugar with one part water until the sugar dissolves. Since the syrup dissolves more easily in liquid, it is a practical way to sweeten cocktails. A wonderful way to flavor cocktails, they also make for great garnishes. Almost every cocktail looks and tastes better with a touch of citrus, be it in the form of juice, zest, peel, or slice.